The Red & Lavender Rose Bouquet by FTD beautifully expresses your love with its gorgeous combination of color and elegance. 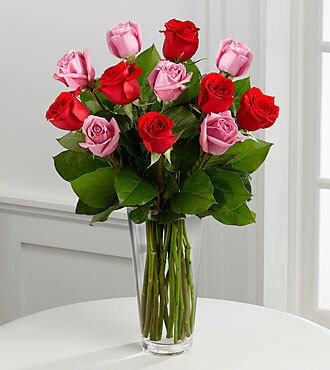 Rich red roses mingle with lavender roses accented with vibrant greens, all arranged in a clear glass vase to make a lasting impression on your special recipient. Please note: Pink roses may be used in exchange for Lavender roses due to availability.